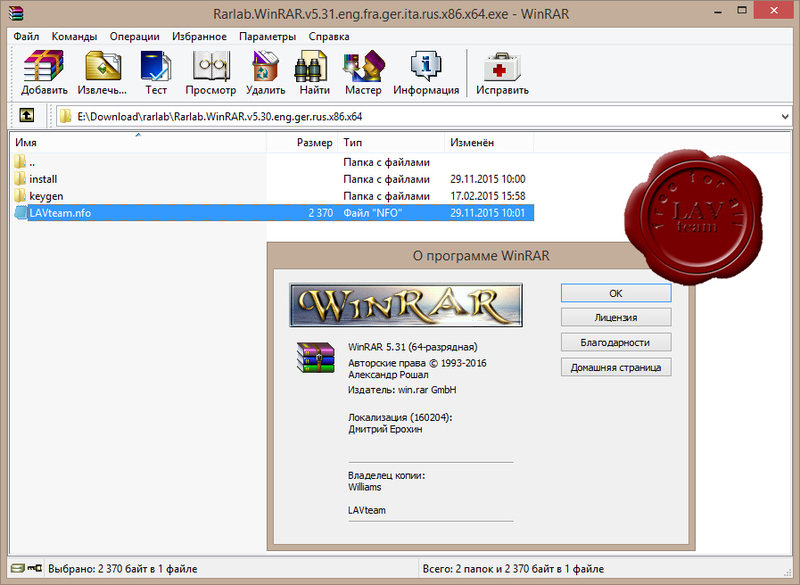 WinRAR больше не поддерживает Windows 98, Windows Me, Windows NT. as archives first or to execute or open them in associated programs. c) "Run" for executables, "Open in associated application"
and archive files with non-archive extensions. as well, provided that they have a correct byte order mark. Previously it allowed only little endian file lists. 15. Minimum supported Windows version is Windows XP SP3 now. 16. "Settings/File list/Allow all uppercase names" option is removed. В отчетах WinRAR в формате HTML или Unicode корректно отображаются неанглийские символы в именах файлов. 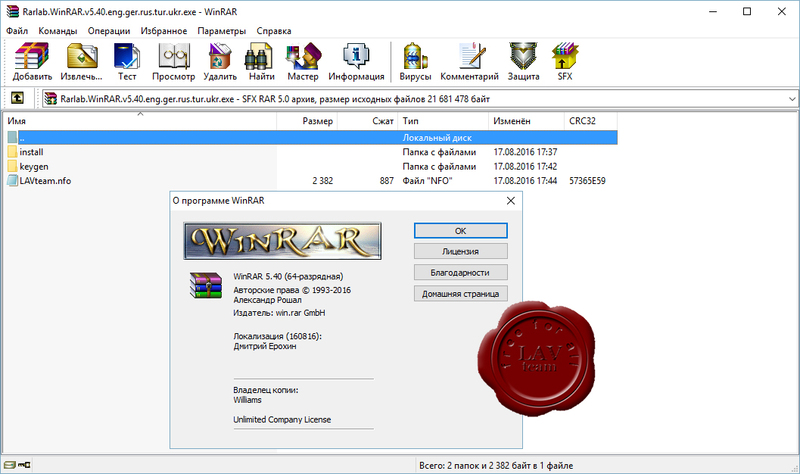 При создании томов RAR в FAT или FAT32 WinRAR автоматически ограничивает максимальный объем тома до 4 ГБ минус 1 байт, так как эти файловые системы не поддерживают файлы объемом больше 4 ГБ. a folder without suspicious DLL files. archives published in news in September and October 2015 is incorrect. 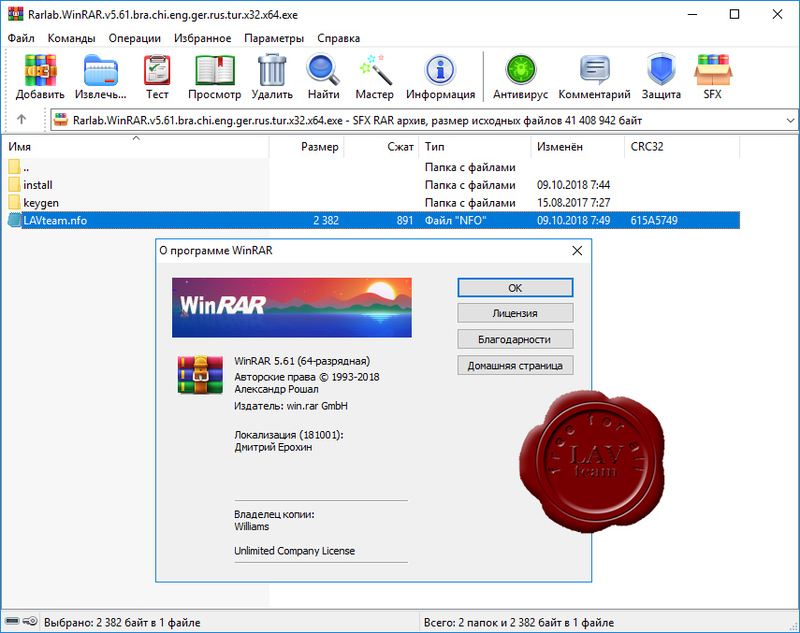 new risk factors for WinRAR SFX archives. Please read http://rarlab.com/vuln_sfx_html2.htm for more details. No patches for WinRAR are needed. 2. Added extraction of multipart ZIP archives created by 7-Zip. Such archives have .zip.001, .zip.002, ... file extensions. in the same folder before starting extraction. for '2015*' also in c:\backup subfolders. encrypted archives while performing search command. 8. Archive test command works for tar.gz, tar.bz2 and tar.xz archives. only validity of GZIP, BZIP2 or XZ container. of errors. Now it works fast regardless of errors number. will produce Unicode list.txt with archived file names. .7z archives. Previous versions set it only for non-empty folders. and when clearing "Archive" attribute of archived files. the module start time in "YYYY-MM-DD-HH-MM-SS-ms" format. based unique installation path, such as "Path=myapp-%sfxstime%". saved with -os switch if it was split between different volumes. and dropping files with right mouse button. likely now. In most cases volume size equals to specified by user. with "Allow absolute paths in symbolic links" option on "Advanced"
page of extraction dialog or with -ola command line switch. if you are sure that archive contents is safe, such as your own backup. f) black rectangles were displayed instead of toolbar buttons in 16- and 24- bit screen color modes and Windows custom text size larger than 100%.